One of the most beautiful cities in North America, Vancouver, British Columbia grew from a small lumber village in the 1800s to the third largest metropolitan area in all of Canada. Located at the point where the Fraser River spills into the Pacific and at the abrupt conflux of the Cascade Mountains and Coast Range, Vancouver is spectacular in its scenery. It is also a major cruise port for vacationers heading to Alaska, with over 250 departures during the spring and summer season. While in Vancouver, you will find no end to the attractions, beautiful landmarks and historical architecture that make this one of the most modern cosmopolitan cities on earth. 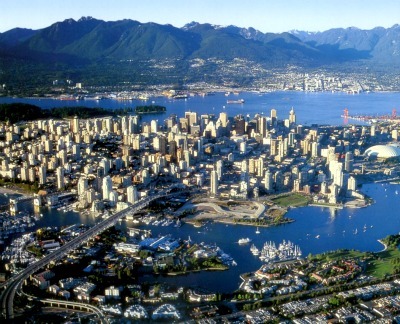 Vancouver is served by several different cruise lines, and has two separate cruise terminals. One is Canada Place Terminal, directly in front of the central business district and adjacent to hotels, shopping and restaurants. The other is Ballantyne Pier - about a ten minute taxi ride from downtown. There is a shuttle service available between the Ballantyne Pier and the downtown. Visiting the Gastown district is a must for tourists. Part of the downtown area, it is the oldest section of the city and is still paved with cobblestone. Here you can marvel at the old gaslight structures, hobnob in the many curio shops and find just about every type of lunch and dinner fare. Near the Canada Place terminal is the Harbour Center Tower, offering a speedy elevator ride to the top, where you can get a full 360 degree view of the city. For families, there is no better destination than Stanley Park, one of the largest urban parks in North America. At the northern end of the downtown area, this large open space is perfect for strolling, especially along the outer shore where the photo opportunities never end. The Vancouver Aquarium Marine Science Centre is also located here and is worth an entire afternoon. The Granville Island market area is a local favorite for its fresh produce and other fine foods, but also includes the artists' area where homemade crafts are available for purchase. There is even a special Kids Market where every toy imaginable is for sale, including handmade wooden delights and one-of-a-kind costumes. Along the waterfront there are several city boat tours that take visitors past the downtown area for a reasonable price. 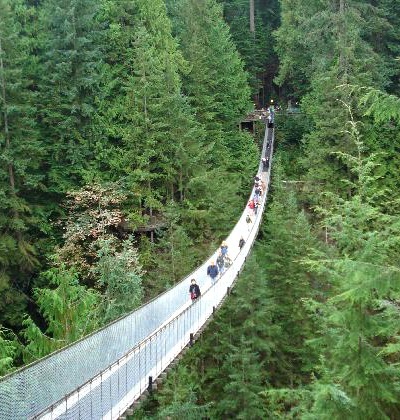 And if you are truly feeling adventurous, head north of Vancouver to the world famous Capilano Suspension Bridge, where the bungee jumping sport is taken to new heights - 230 feet to be exact - and featuring the new Treetops Adventure, where a series of smaller bridges connect with each other far above the river rapids. Vancouver is chock full of excellent restaurants, especially those specializing in seafood and Oriental cuisine. Try the Dockside Restaurant and Brewing Company, located in the Granville Island district and complete with its very own microbrewery. The Alaskan king crab, halibut and salmon dishes are superb. Also of note is the Joe Fortes Seafood and Chophouse at 777 Thurlow, featuring yummy fish, shrimp and oysters. In Stanley Park families will find the Prospect Point Cafe, with its own kid's menu and offering up reasonably priced entrees like halibut fish and chips, grilled salmon steaks and various burgers. The cafeteria-style Hon's Wun Tun House at 1339 Robson Street is perfect as a casual dining destination. Its attractive open kitchen design lends a personal, homey feeling and is quite popular with the locals. Taxis are plentiful and can be called on at any major hotel as well as the cruise terminals. The public bus service operates routes from the central business district to every outlying neighborhood, and the shuttle service from Vancouver International Airport serves the waterfront and both cruise terminals. The public transit system also includes the Skytrain light rail as well as the Seabus, which connects the center of town to North Vancouver. The Canada Place cruise terminal, Gastown and Granville Island are all within walking distance of each other. 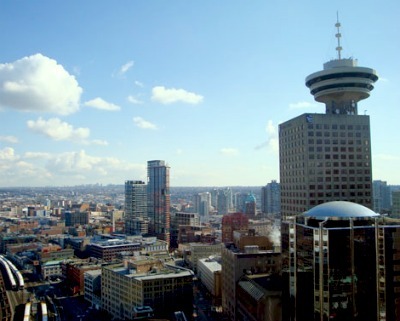 Vancouver has a moderate Pacific climate, and rainfall is scarce during the summer months. However, the marine influence can mean chilly evenings even in July. There are plenty of Internet cafes in town, and most hotels have WiFi connectivity. Also remember that the ATMs will dispense only Canadian currency. If you are driving from the United States to Vancouver - from Seattle, for example - you will need to have either a passport or enhanced style driver license at the border crossing. Aerial picture of Vancouver. Can you see the beautiful mountains in the back? Harbour Center Tower on the right is the best place to get an overall view of Vancouver. People walking on the famous Capilano Suspension Bridge. 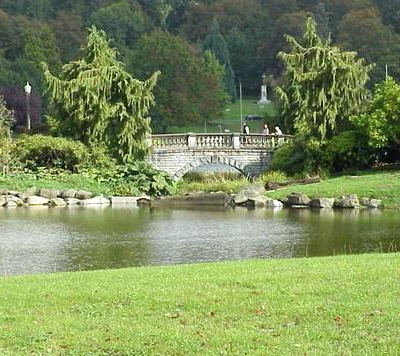 Stanley Park is a great place to spend a relaxing afternoon.